With Mental Health Awareness Week 2018 beginning on 14 May, Sanctuary Supported Living (SSL) project worker Gemma Miller discusses how mental health training has helped her to better understand the needs of her clients with learning disabilities. As a project worker at SSL’s Nickleby Road supported housing service in Chelmsford, Essex, I work solely with residents whose primary support need is learning disabilities. "People with a learning disability may not be aware they have a mental health need, believing their symptoms to instead be a part of their disability." 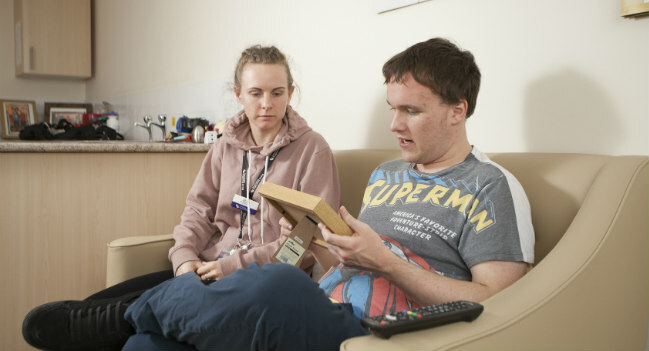 For a large number of our residents – around 60 percent – a dual diagnosis of a mental health need is something that necessitates extra consideration when delivering a personalised support package. While the majority of my work focuses on helping our residents offset the challenges posed by their learning disability and achieve their own goals, I also felt it was important to get a better understanding of their mental health needs. While a quarter of the general population will experience a mental health need at some point in their lives (Singleton et al, 2001), this figure can reach as high as 40 percent among people with a learning disability (Taylor et al, 2004). In the care and support sector, a solid understanding of these needs can help reduce the number of steps in a referral pathway and deliver immediate short-term support. Unfortunately, in many cases people with a learning disability may not be aware they have a mental health need, believing their symptoms to instead be a part of their disability. To this end, I took on study for a Level Three Qualifications and Credit Framework (QCF) in Mental Health Awareness, arranged through Sanctuary as part of its support for professional development. Covering a range of conditions from psychosis and bipolar disorder to postnatal depression, the course provided excellent insight into how such needs are diagnosed, how to differentiate between conditions with similar symptoms and the various support services available to patients with these needs. Already, the training is paying off. One resident – Gill* – was spending a lot of money and was experiencing drastic mood changes and, after doing an online search of her symptoms, worried that she had bipolar disorder. However, thanks to the training, I could identify that many of the symptoms tied to bipolar were not present. While there were fluctuations in mood, there was no mania stage and Gill remained rational throughout. I soon suspected she may actually have personality disorder – something no bipolar medication is currently thought to be able to help. I encouraged Gill to create a mood diary and record her feelings. After a week, we sat down and reviewed it and I explained how people can have good days and bad days, and that we would book an appointment with the psychiatrist to learn more. By being able to identify the symptoms when presented in this way, we have demonstrated there is a support framework at Nickleby Road for her, and we can help her access the services she needs. Another resident, David*, is taking Amitripyline medication for his depression and anxiety that includes a number of unpleasant side-effects including heart palpitations, sweating and trouble sleeping, as well as being potentially addictive over the long term. Speaking with David, I suggested we look at cognitive behavioural therapy (CBT) through mental health charity MIND. As a result, David has reduced his dosage from three times a day to twice a day and is making progress with the CBT, by attending group sessions that contained advice on managing anxiety. [Editor's note - do not change medication or dosages without GP consultation]. The sessions taught David how he could turn negative thoughts into positive ones, such as helping him to find a new job after worries he was stuck in his existing one. David had this feedback about the support I could provide for his mental health: “The advice and pointing in the right direction for support helped, and knowing I had someone to talk to who could provide me with support and assist with referrals, rather than going alone, which I had done in the past." Following on from these results, and the confidence it has given me, I will also be looking to take Mental Health First Aid training through SSL’s parent organisation Sanctuary Group. This will help me to apply mental health knowledge among colleagues and be aware of warning signs they may need help or professional support. We here at Nickleby Road believe early intervention is key to ensuring a sustainable and positive outcome for all with mental health concerns. Mental health is an issue that affects so many of us; we owe it to ourselves – and those we work with – to take it seriously.